Ductless heating and cooling units, also called mini splits, are versatile in size, install location and style, they are a perfect solution to most home comfort needs. Ductless Mini Split to the Rescue! While our main focus will always be installing furnaces and central air conditioning, there are times when expanding a system is not practical for the homeowner’s situation. 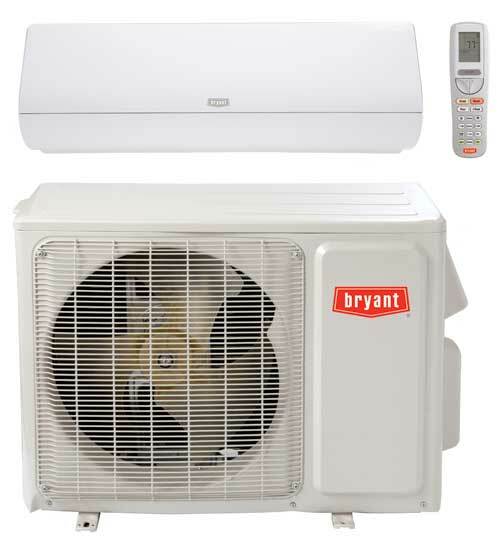 In those cases we install Bryant® Ductless systems, which give you control over the temperature in each room in which they are placed, allowing you to personalize your comfort for the activity in those rooms. With ductless, you can address hot and cold spots throughout the home, make a sunroom more functional for all seasons or provide added comfort. Ductless heating and cooling systems are the solution you’ve been wanting for renovations or additions where they are not able to connect to existing ductwork in your Colorado home. If you are expanding your home, don’t waste energy and money extending your heating or cooling to seldom used or virtually unoccupied room. Go Ductless! We install ductless hvac systems with advanced inverter technology that will supply constant and comfortable temperatures than you might think possible. The compressor speed adjusts to heating or cooling needs with a variable speed compressor that does not operate continually at maximum capacity. High wall mounted, or floor level units, we have many models to choose from to make your home comfort the best it can be. Call us at 303-975-6090 for a quote. For rooms with hot or cold problem spots, ductless systems provide more control, targeting those areas with uneven temperatures for more consistent comfort, even in ducted rooms. Our ductless systems inverter technology allows the system to run longer cycles at lower fan speeds, which helps at higher temperatures in attics, and better control of comfort in lower natural-light conditions typical in basements. Ductless mini split systems can more easily be integrated into additions, because they don’t require a connection to existing ductwork. This means no special accommodation needs to be made for additional space between walls or above ceilings. Did you finally get your house back after raising your kids? Less kids may mean changing the use of spaces in your home, with some rooms no longer being used every day. A ductless split system can be configured so you are only heating or cooling spaces when using them, and saving on energy when they’re not. In a room with a lot of windows and less wall space to hang a unit (as in a sunroom with mostly glass walls), a we can install a floor console unit, which is installed detached from the wall on feet, allowing for even lower-impact installation. For a space, like a garage, that may not be connected to your central HVAC system, ductless offers compact cooling and heating power to keep you comfortable tinkering in the garage all year around. Call us at 303-975-6090 for a quote on a ductless split system for your home in the Boulder/Longmont area.